Earlier in the year google launched Google Analytics 360 Suite a data visualization and reporting platform for large enterprises. On May 25, 2016 Google dropped a free version of Data Studio for the rest of us! 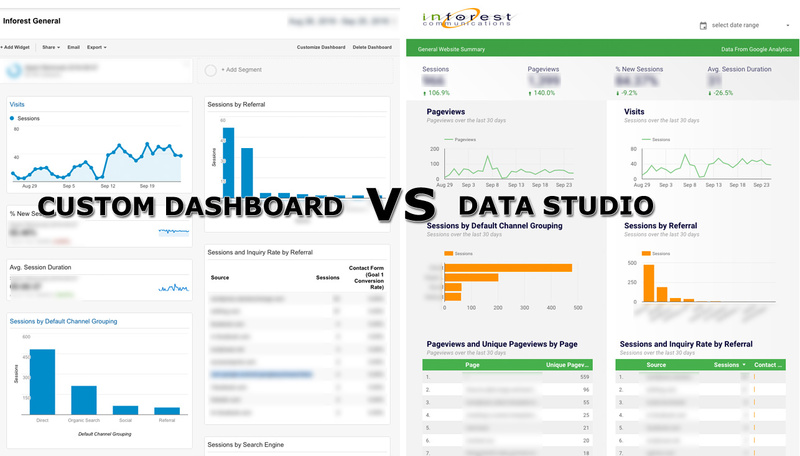 So what is this “data visualization suite and reporting platform?” Basically Data Studio is a Google Analytics custom dashboard report on steroids. the platform allows you to take custom “metrics and dimensions” from google analytics and make fancy interactive reports out of them. This fills the report quality gap in the current design-centric world that we live in. 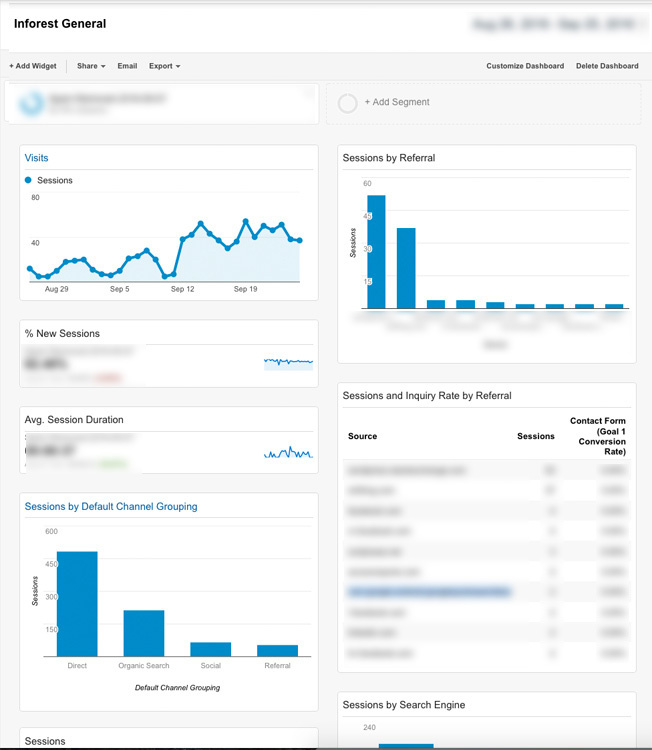 Over the past year or so we created custom dashboards in Google Analytics then exported or gave the client access to the report. The information provided is great; you can set and configure endless amounts of data and statistics on your website’s performance. Another advantage of setting up a custom dashboard is that it lets you show only the most important selections to the client. We created custom reports for all of our clients as well as separate reports for clients with e-commerce websites. The drawback is that the design is not customizable. It is a basic clean business blue and black with white background. That’s OK and it’s functional, but we dream in color! Data Studio allows you to add custom colors (like the ones matching your website) and add logos and graphics. You can change fonts and colors of the graphs and charts. The finished report is much more professional and branded. 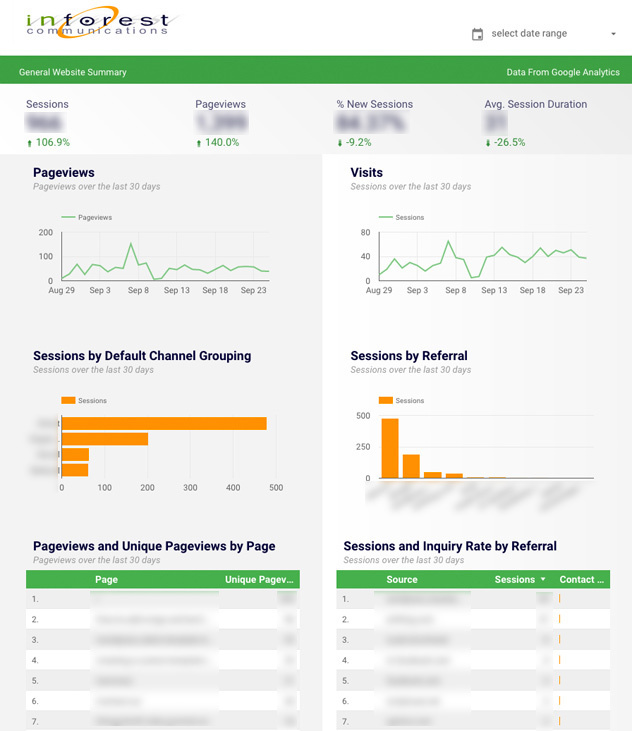 This new program really adds value to the Google Analytics reports. With Data Studio you get all the same functionality as Google Analytics to filter your data and display tables and charts. However, now you can not only use Analytics data, but also use data from Adwords, Attribution 360, Cloud SQL, Google Sheets, MySQL and YouTube analytics in your snazzy reports. It is real easy to use and the “make a copy” feature allows you to duplicate reports. The one bottleneck is that you have to change any filters and change the data source for all the components. Either way it is much easier than starting from scratch. Sounds great, right? Well there is one caveat: You only get 5 new reports in the Beta version! Ugh! Oh well, we are on Google’s email list when they move the platform out of beta. Until then, we will continue to experiment with this new Google product and write more about how you can set up your own Google Data Studio reports in the near future.